For the last couple of posts we have been focusing on older children and the transition from “rules” alone to “principles” to live by. 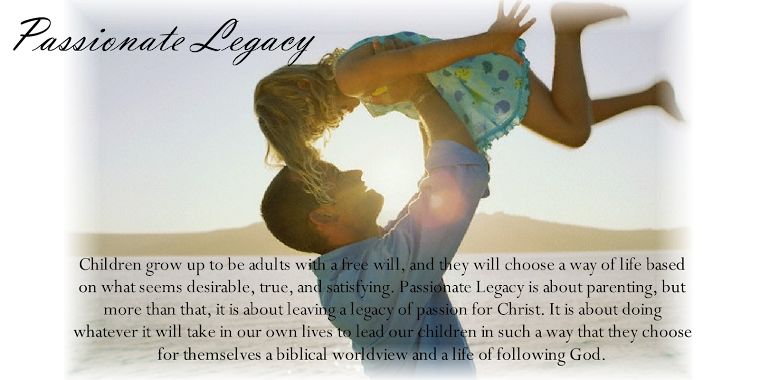 This week we turn our attention back to younger kids and pick up with Passionate Legacy Principle #5: Expect First Time Obedience. I have seen it too many times. A parent calling for a child to come to them, or giving a command over and over and over again, only to be ignored by little Suzie. This usually ends in frustration and a lost temper OR a passive ignoring of the disobedience. The first sends the message that the parent is not in control of himself, the child, or the situation and the second sends the message that your word is meaningless. Both result in loss of respect from the child and continued disobedience. To prevent this, a parent must teach and consistently expect first time obedience. Always ensure that your word is obeyed. Expect first time obedience without argument, bad attitude or having to give several “reminders” (aka nagging). Do not accept partial obedience. Don’t limit your children with your own low expectations, they will live up to the standard you set, whether low or high. Make your word valuable by enforcing the rules, if you don’t, your word means nothing and your rules are meaningless. Your follow-through will make your words either garbage or gold. Never give a command you don’t intend to enforce. This concept of first time obedience is more difficult for parents than for children, but if we can train ourselves to be consistent with our follow-through, our children can learn to obey the first time. If a child does not obey when they are told to do something, it will be necessary to use the proper discipline. Please see the post: Be Prepared with the Proper Discipline for a step by step explanation of proper discipline procedure for a small child. Please see the post: See Discipline as Teaching, for some ideas for older children. The tips listed below will help in almost any situation or age. 3. If at all possible, give a choice. By saying to the child, “You can choose to do either this or that,” you empower the child and give him or her a sense of control. However, the choices you offer must be legitimate choices that you can live with. Examples: “You can either go to bed right now or hear a story and then go to bed.” “Would you like to play for 10 more minutes before we go or go right now?” “You can play without pushing or you can sit out for part of the game.” Never give a choice where there is no choice, and do not ask children if they want to do it. For example “Do you want to go to bed now?” or “Let’s go to bed, okay?” By asking children if they want to, or if it’s “okay,” you have given them the choice of not going to bed. It is not fair to expect a child to mind when you have not given a clear command. An important point: If children refuse to act on either choice, you must make the choice for them. If the child refuses to move, you can step in to use the proper discipline. 4. If you cannot give a choice, sometimes you can describe the facts of the situation. For example: “It’s time to go home.” or “The table is not for sitting on.” Another example: a two year old boy was grabbing all the cards from his three year old brother while their mother unsuccessfully tried to persuade the two year old to share. Finally the grandmother simply said, “Those cards belong to your brother.” Immediately the younger child dropped his brother’s cards and went off to do something else. Next week we will continue with more tips for achieving first time obedience.